Including the build number in your assembly version number can be a very useful feature. Using reflection you can retrieve you assembly version number and display it appropriately in your app. 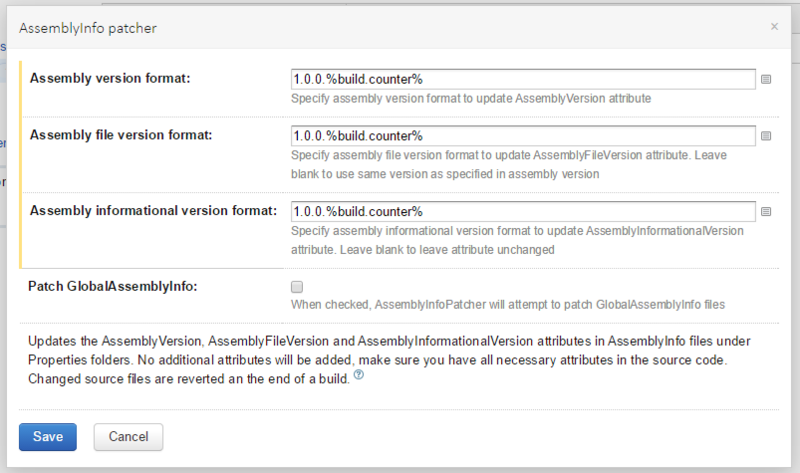 Here is how to add a build number to your Assembly Version using TeamCity continuous integration server. TeamCity is a continuous integration server developed by JetBrains. If you are looking at trying a new build server, I highly recommend giving it a try. 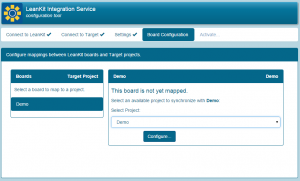 It should take no longer than a hour or two to install, configure, and build your project. There is a built-in build feature that allows you to modify the AssemblyInfo.cs during the build process. This feature works by scanning for all AssemblyInfo files (.cs, .vb, .cpp, .fs) in their usual file locations and replaces the AssemblyVersion, AssemblyFileVersion and AssemblyInformationVersion attributes with the values you define. 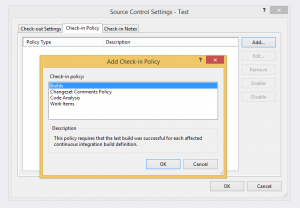 Under your build configuration settings, add a new Build Feature. Select the AssemblyInfo patcher. Here you will be able to specify the version format by using parameters or static text. In my example below, I’m including the %build.counter% parameter in the version format. That’s it! After the build is complete, the assembly outputted now contains the file version with build number. 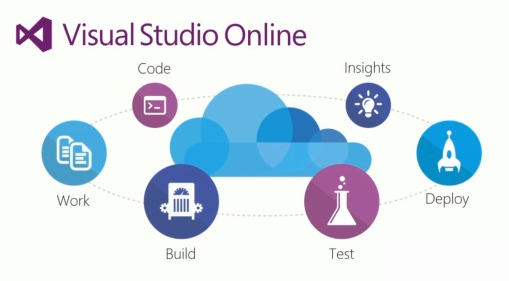 Want to produce better code and more efficient development group? Start using Visual Studio Online check-in policies within your team project. 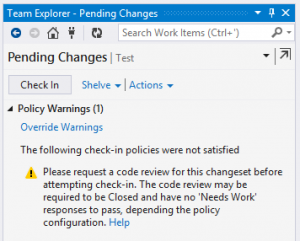 Check-in Policies are rules you can define at a Visual Studio Online team project which are enforced when a developer attempts to check-in their source code. 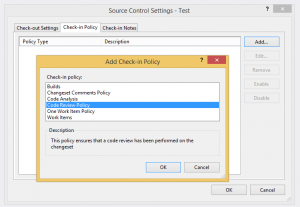 Note: You must be using Team Foundation Version Control (TFVC) with your project in order to use the check-in policies. 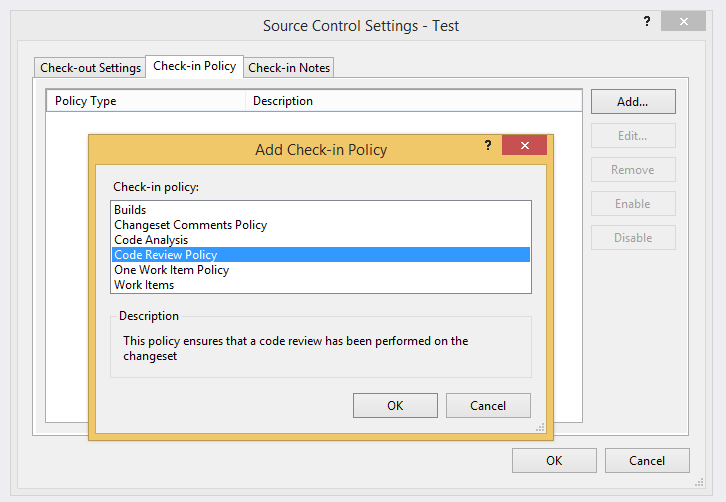 Although VSO now supports Git as a version control system for your team project, check-in policies are not supported. 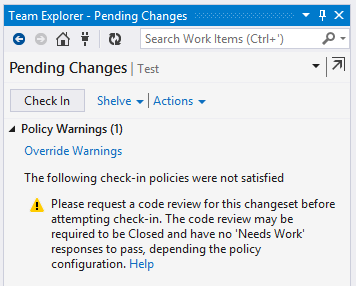 One of the main reasons I started using check-in policies was to enforce associated work items to a changeset. Having all changsets associated to work enabled me to automate the creation of a change lot during the build process. 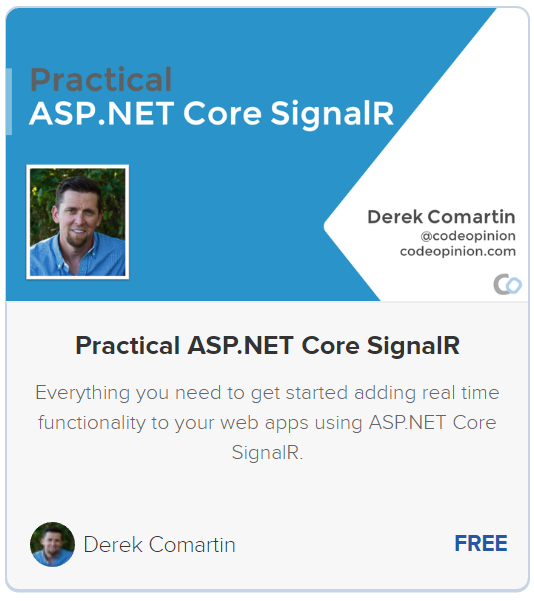 If you are looking for better way to visualize your Visual Studio Online work items, take a look at my LeanKit Visual Studio Online Integration blog post. 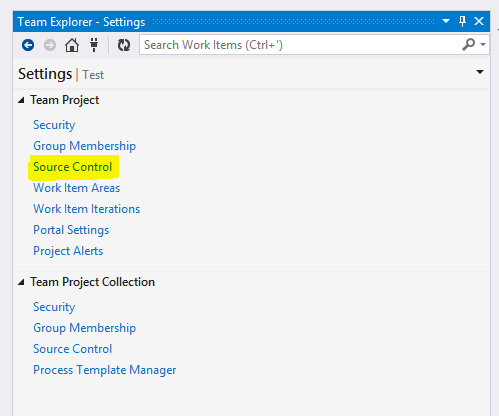 From the Team Explorer, access the settings menu and select Source Control under the Team Project heading. Under the Check-in Policy tab, click the Add button to select the policy you want to add. 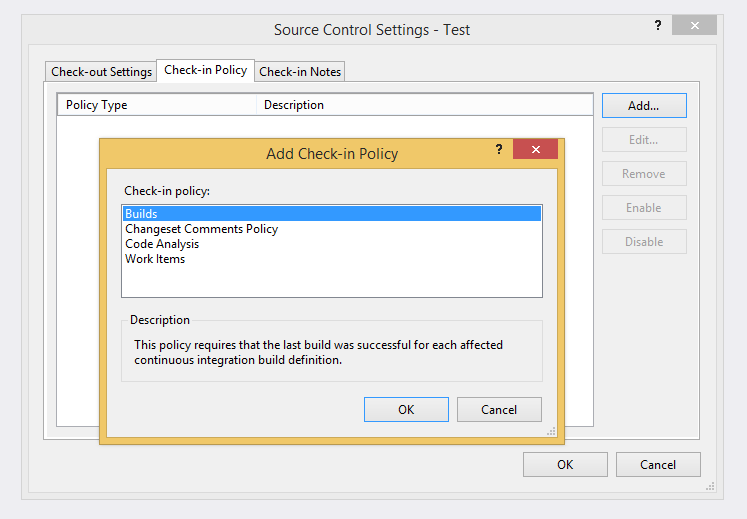 Requires that the latest build was successful for each affected continuous integration build definition. Requires the developer to provide comments with the check-in. These comments will be associated with the changeset. Requires the developer to run Code Analysis from Visual Studio prior to check-in. Requires the developer to associate at least one work item with the check- in. 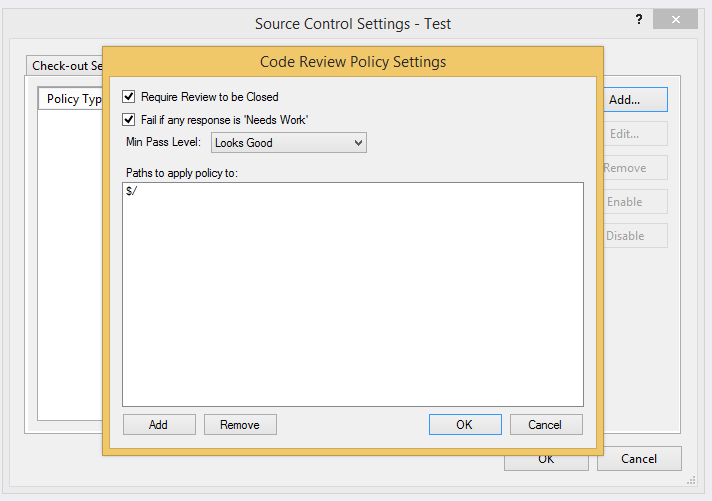 There is a great policy written by Colin Dembovsky (@colindembovsky) on Visual Studio Gallery that provides Code Review Policy. Once the extension is installed you will now have a new option available to add. Once this policy is added, you will be unable to check-in until a Code Review has been requested, closed, and has no “Needs Work” response. 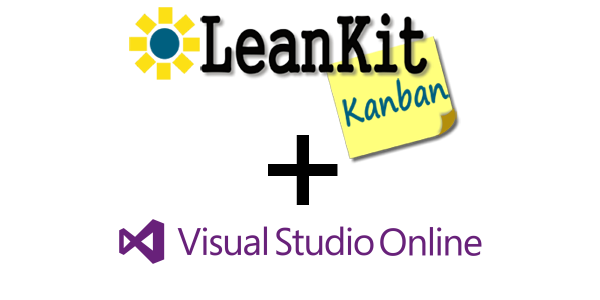 LeanKit and Visual Studio Online are both two great tools. Why not use them both? 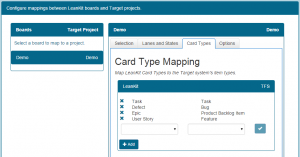 Here is a guide to integrate LeanKit and Visual Studio Online. Although Visual Studio Online (and Team Foundation Server) provide a task board to visualize work items and flow, I prefer to use the fully customized Kanban board by LeanKit. 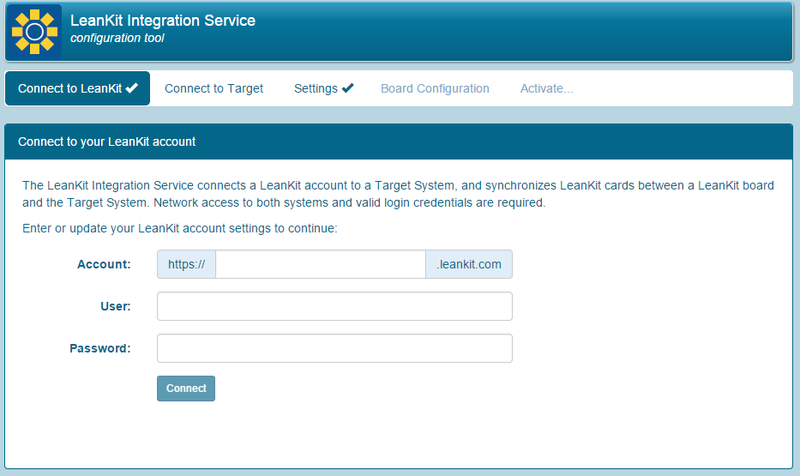 Thankfully, I found out that LeanKit has created an Integration Service, which is available on GitHub. Overall the installation and configuration is fairly straightforward. However, there were a couple hiccups I encountered along the way that inspired this how-to. 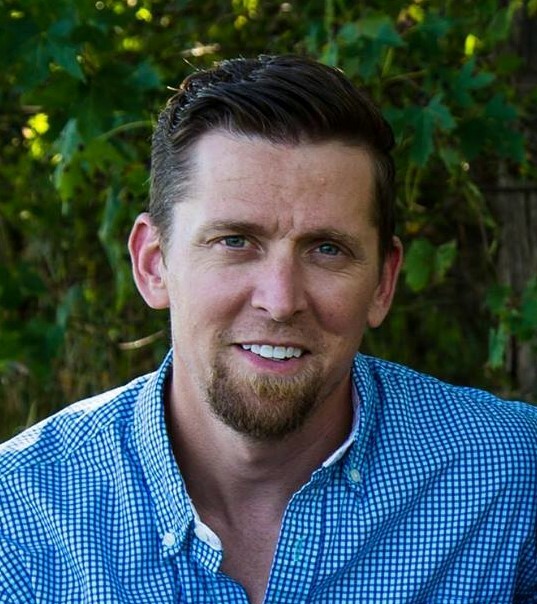 I also wanted to point out that main contributor to the integration service, David Neal (@reverentgeek), was very helpful in answering questions via Twitter. Check out the source code if you’re interested, pretty nice code. Download the latest zip/executables from LeanKit’s website here. Follow the installation guide provided by LeanKit. Although LeanKit provides a bit of an overview on the configuration, follow these steps specifically for connecting to Visual Studio online (or Team Foundation Server). 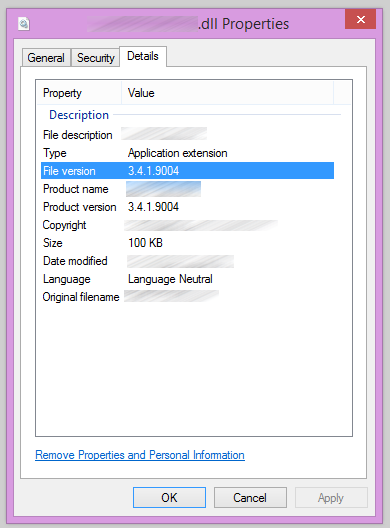 Before you configure the integration service, you must enable alternate authentication credentials to your Visual Studio account profile. This allows you to specify a username/password the integration service can use to connect to Visual Studio Online Web Service. When in Visual Studio Online, access your account profile to enable the alternate authentication credentials. 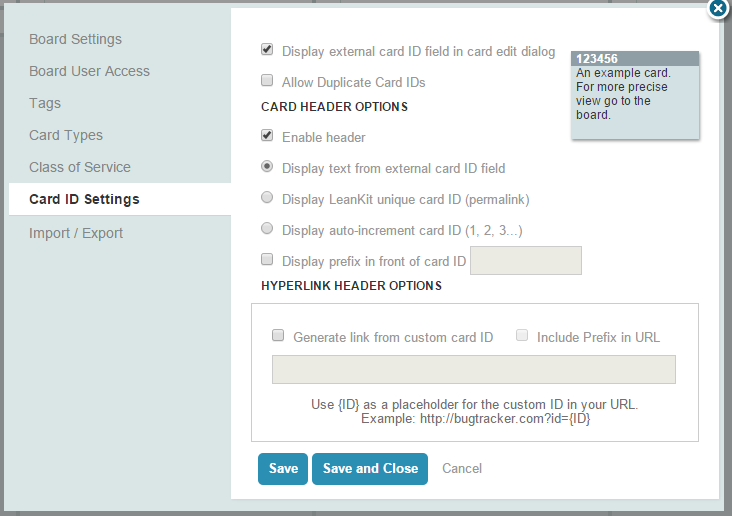 In your LeanKit board settings, go to the Card ID Settings section. 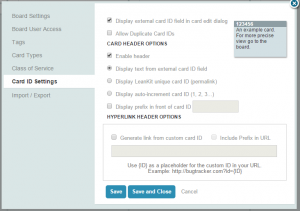 Here you will want to make sure that you are using the external card ID. Do not select the auto-increment card ID setting because we want the Card ID to be the same as the Visual Studio Online Work Item #. 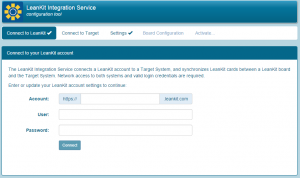 After installation, browse to http://localhost:8090 to access the web interface. 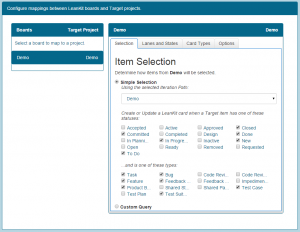 Specify your LeanKit account and credentials. 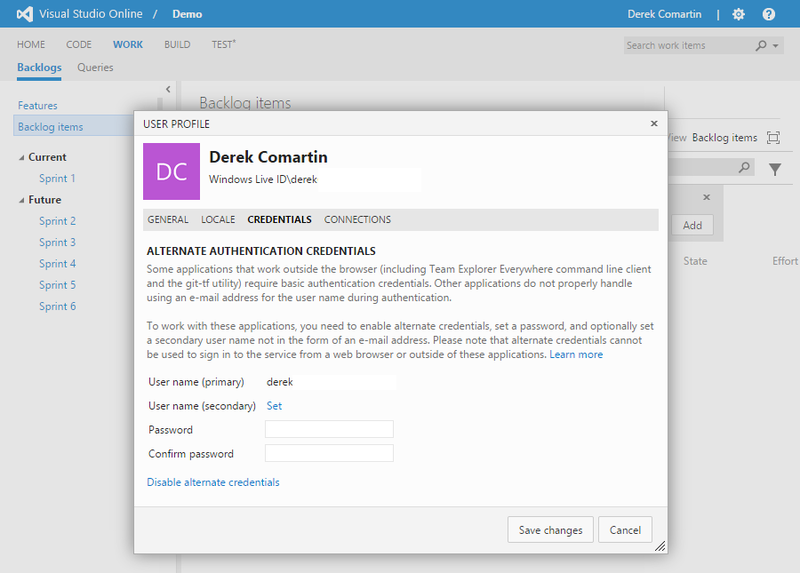 Next, specify your Visual Studio Online account and alternate access credentials. 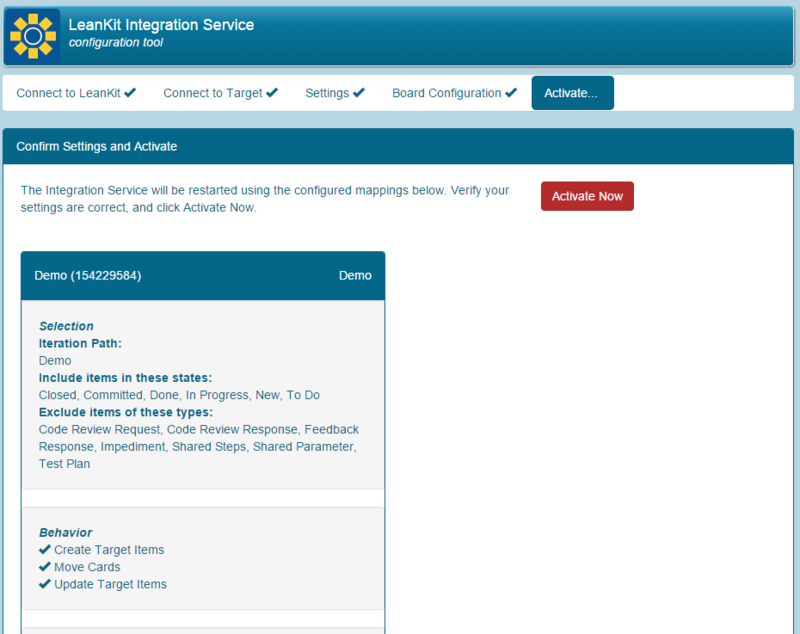 The integration service is very configurable in terms of mapping LeanKit Cards to VSO Work Items and different status. Select the LeanKit board and the Visual Studio Online Project you would like to create a mapping for. In the Selection tab, you will want to select the VSO Work Item States and Types that will be mapped to LeanKit. 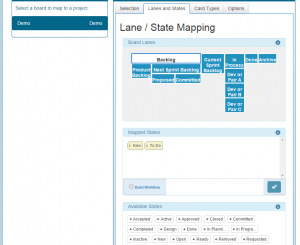 The Lanes and States tab will be populated with the swim lanes and columns from your Kanban board. Select a column or lane and then select an available state to map. 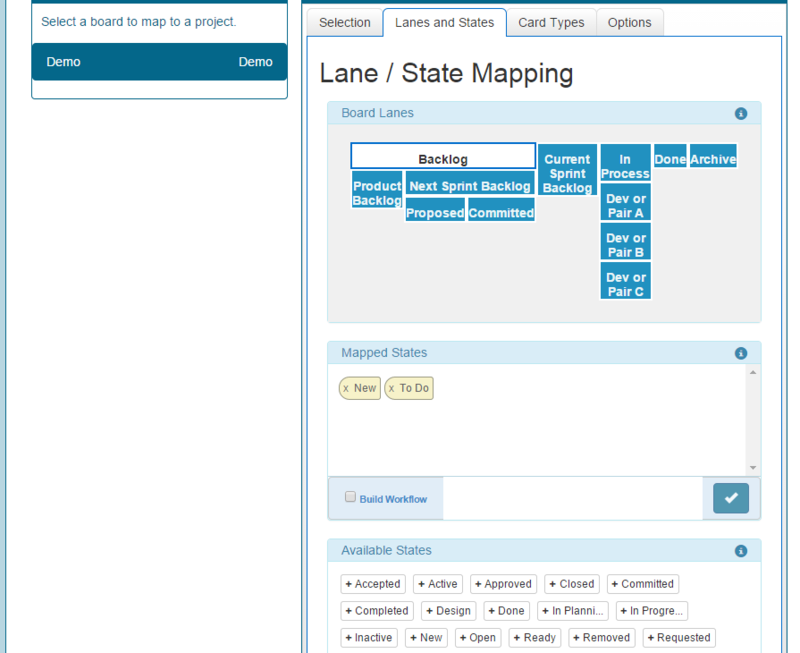 The intent here is to specify if the LeanKit card moves to that column/lane it will be updated in VSO with the mapped State. If you define multiple states, only the first matching state will be used. In the example below, I’ve mapped the Backlog column to the New and To Do VSO states. 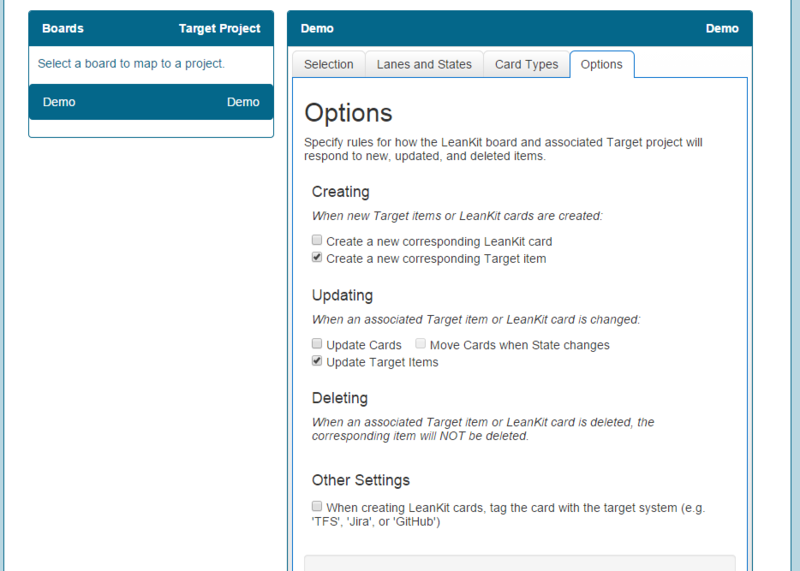 In the Card Type tab, specify which LeanKit card types you want to map to which VSO Work Items. 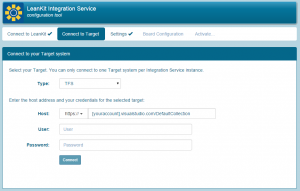 In the Options tab, specify how you want the integration service to sync. It can sync changes bi-directional, however for my usage, I only want to push changes from LeanKit to VSO. 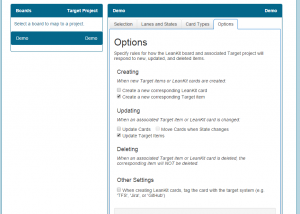 As mentioned above, I only want to use LeanKit for managing work items, however I want them to be in VSO so I can associate work items to changesets. Be sure to click the save button if you haven’t already. 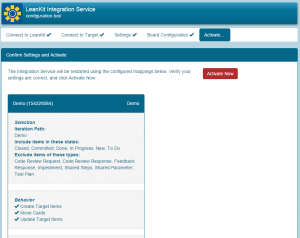 What may not be obvious at this point is that you need to Activate your new configuration. Click on the Activation tab, then click on the big red Activate Now button. 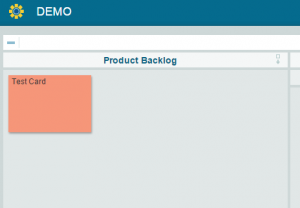 I’ve created a LeanKit Defect Card in my Product Backlog and the Integration Service has created the Bug work item in VSO.